Kamote Cue, Camote cue or Sweet Potato Fritters is a very popular snack food / street food in the Philippines; it is made out of deep fried Sweet Potatoes/Kumara coated with caramelized brown sugar. The word came from combining two words Kamote (Sweet Potato) and Cue (to skewer), similar to barbecue and banana cue that’s why during the past this was served in bamboo skewers but they started to serve it now like french fries where sweet potatoes are sliced like chunky style potatoes and is placed in brown paper bag. A very delicious street snack that I guess will be easily enjoyed by everyone specially those who have that sweet tooth. Heat oil in pan then add sweet potatoes. Deep fry for 2 minutes. Pour in the sugar and wait until it caramelizes, once the sugar melts give it a good mix so that the sweet potato pieces will be coated with the melted sugar. Using a slotted spoon, remove sweet potato pieces, cool in a wire rack then serve. 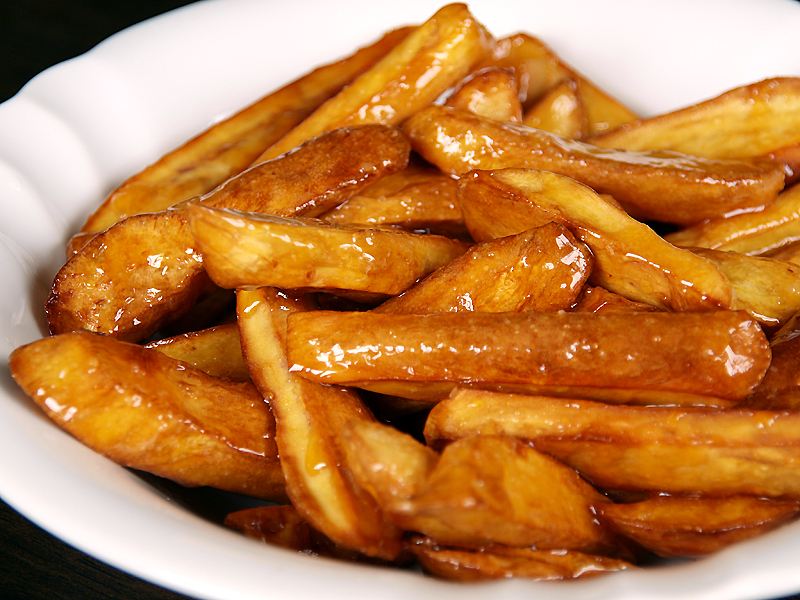 What a great idea to make these fries sweet. I am more of a savory on sweet potatoes kind of gal, salt, cumin, cayenne…but I know how popular sweet is and how it brings out the natural sweetness of the potatoes. Love how they glisten in this photo! omg this sounds sinfully wonderful. I’ve have to try and make these. Thanks for passing along the recipe. My son would love this! We love eating this with fried chicken. I hope you could add this sweet potato widget at the end of this post so we could add you in our list of food bloggers who blogged about sweet potato,Thanks! My family enjoys eating sweet yellow potatoes and sweet purple potatoes. Generally, we bake them and eat them with savory spices (salt, ginger, pepper, marjoram, cumin, and other). Your “sweet” sweet potato recipe reminds me of a sweet yam Southern dish, delicious and appetizing. Will consider this as an alternative side dish. Thank you for sharing. This is a great afternoon snack with a great cuppa coffee! great snack and sweet potatoes are so healthy, but will do away with the sugar or use lesser. oohhh, these look delicious. Like dessert!